Below are the key Business Email Etiquette issues that need to be considered with every commercial e-mail sent. These are the issues business owners, their employees, and Netrepreneurs need to be aware of in their day-to-day online communications to ensure the best possible results. Professional Behavior on the Job: Know that how you use your e-mail, company e-mail address, and employer’s technology is a serious issue! Sending non-business related e-mails, jokes, forwards, or chain letters on company time to friends or coworkers reflects on your lack of professionalism. Visiting Web sites that are questionable or not necessary to your job responsibilities will reflect poorly on your ability to be trusted. Never assume that these activities are not being monitored. While on company time do not assume you have any privacy when using company resources and equipment. SUBJECT: Field: The SUBJECT: field is the window into your e-mail and can many times determine even if your e-mail will be opened. If this is an initial contact with a customer based on their request through your site or otherwise, be sure to have a short SUBJECT: that indicates clearly what the topic of the email is. Typos, all caps, or all small case can lend to the impression you may be spammer. Level of Formality: Try to avoid the prevailing assumption that e-mail by its very nature allows you to be informal in your business e-mail. Only time and relationship building efforts can guide when you can formalize your business relationships and your e-mail’s tone. One should communicate as if your e-mail is on your company letterhead. This means black text and standard fonts, too! This is your business’s image you are branding! Addressing: How do you address your new contacts? I would suggest initially that you assume the highest level of courtesy: Hello, Mr. Anderson, Dear Ms. Jones, Dr. Osborne, etc., until your new contact states, “Call me Andy” or “You can call me Diane.” You will also be able pick up clues on when you can have a more relaxed tone by how contacts approach you, as well as how they sign off. Most business people do not mind being called by their first name; however, in a global economy that can be perceived as taking premature liberties in the relationship if used too soon. TO:, From:, BCc, Cc fields can make or break you: In the TO: field make sure you have your contact’s name formally typed. John B. Doe – not john b doe or JOHN B DOE. In the FROM: field make sure you have your full name formally typed. Example: Jane A. Jones. Not: jane a jones or JANE A JONES. The later two give the perception of lack of education or limited experience with technology. By only including your first name or e-mail address you are giving the perception you may have something to hide or do not know the basics of configuring your e-mail program. 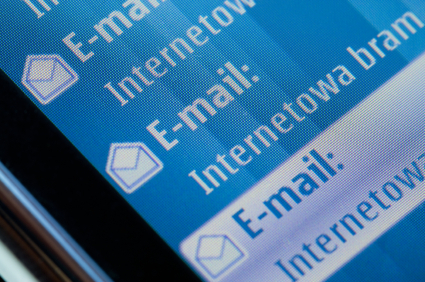 BCc: use this field when e-mailing a group of contacts who do not personally know each other. Listing an arm’s length list of e-mail addresses in the Cc or TO fields of contacts who do not know each other or who have never met is conducive to publishing their e-mail address to strangers. This is a privacy issue! With those you are forging partnerships with, visibly listing their e-mail address in with a group of strangers will make one wonder what other privacy issues you may not respect or understand. Cc: Use this field when there are a handful of associates involved in a discussion that requires all be on the same page. These business people know each other or have been introduced and have no problem having their e-mail address exposed to the parties involved. If you are not sure if a business associate would mind their address being made public, ask! Reply to All: Use this button with discretion! You need to carefully think about whether “all” really need to be aware of your reply to conduct business. Never use this button to CYA or eTattle on a coworker or colleague — doing so will just make you look petty while increasing others’ e-mail volume unnecessarily. Formatting: Refrain from using any formatting in your day-to-day business e-mail communications. Unless you would type something in bold crimson letters on business letterhead, don’t do it when e-mailing for commercial gain. With all the spam filtering going on today, the more formatting or embedded images, the higher the chance that your e-mail could be blocked as spammy. Even something as simple as using a different font makes your e-mail’s display contingent upon the recipient having that specific font on their system, or it defaults to their designated default font. Keep in mind the recipient may not have their e-mail program configured in such a way as to display your formatting the way it appears on your system – if at all. Attachments: How do you think your relationship with a potential new customer/contact is enhanced when you send them that 10M Power Point presentation they didn’t request and you fill up their inbox causing subsequent business correspondence to bounce as undeliverable? And, if they do not have Power Point, they wouldn’t be able open the file anyway! Never assume your potential customers have the software you do to open any file you may arbitrarily send. If you need to send a file (or combination of files) over 500,000 in size, business courtesy dictates you ask the recipient first if it is okay to send a large file. Next, confirm they have the same software and version you do and what is the best time of day to send it to them to ensure they are available to download the large file and keep their e-mail flowing. Never send large attachments without warning, on weekends, or after business hours when the recipient may not be there to keep their inbox clear. Using Previous E-mail for New Correspondence: If you want to give the perception of lazy, find a previous e-mail from the party you want to communicate with, hit reply, and start typing about something completely irrelevant to the old e-mail’s subject. Always start a new e-mail and add your contacts to your address book so you can add them to a new e-mail with one click. Common Courtesy: Hello, Hi, Good Day, Thank You, Sincerely, Best Regards. All those intros and sign-offs that are a staple of professional business communications should also be used in your business e-mail communications. Always include a salutation and sign-off that includes your name with every e-mail. Here again, think business letterhead. Courtesy also includes that you make the effort to communicate as an educated adult. Type in full sentences with proper sentence structure. Not all caps; not all small case. Proper capitalization and punctuation are a must! You are an educated professional and need to communicate as such. All caps or all small case smacks of either lack of education, tech/business savvy — or laziness. None of which is positive for instilling confidence or encouraging others to want to do business with you. Signature files: Keep your signature files to no more than 5-6 lines to avoid being viewed as egocentric. Limit your signature to your name, Web site link, company name, and slogan/offer or phone number. Include a link to your Web site where the recipient can get all your contact information from A-Z. That is what your site is for. Do not forget to include the “http://” when including your Web site address within e-mails and your signature file to ensure the URL is recognized as a clickable URL regardless of the user’s software or platform. Respond Promptly: You should do your best to respond to your business communications as quickly as possible. This is a customer service issue that should not be underestimated. By not responding promptly you seem unorganized, uncaring, or, worse yet, risk being outperformed by your competitors who understand the importance of appearing efficient and on the ball. When forging new business relationships and solidifying established partnerships, the level of professionalism and courtesy you relay in your business e-mail communications will always gain clients over the competition that may be anemic, uninformed, or just plain lazy in this area.